A Hard Day’s Night. Proscenium Films 1964. 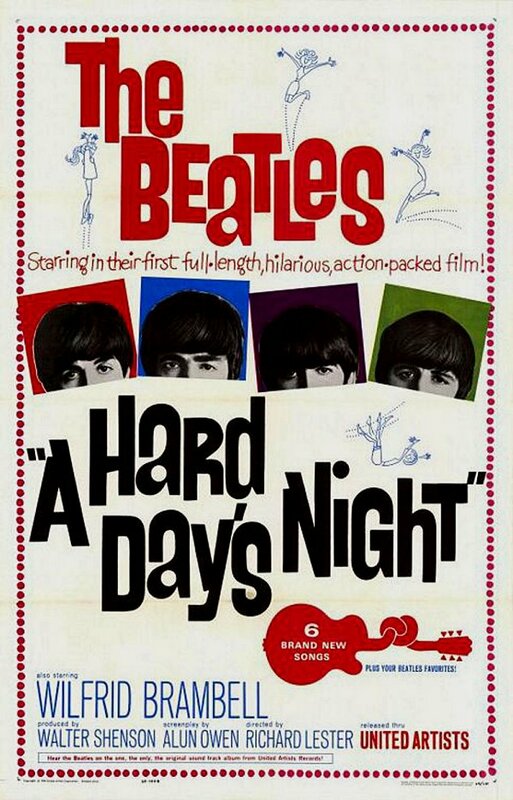 The easy things to pick up about this movie are that it stars the Beatles, it’s their first film, and they sing some songs in it, probably including “A Hard Day’s Night”. What I have a somewhat harder time figuring out is what sort of plot is involved. I would have thought that, almost forty years later, people would have more to say about what the movie is about than “it’s the Beatles’ first feature film!” I have the vague impression that this is just about what their lives are like, perhaps in early mockumentary style. The last time I watched a Beatles movie, Yellow Submarine, I was rather disappointed. I expected it to be light on plot and heavy on songs, but I didn’t expect the latter to the degree it was. It sounds terrible to say, but I hope that since this movie isn’t animated, they spend less time being imaginative and more time telling a story. A foursome of young Liverpudlian chaps in a rock band of some note travel to London to put on a concert for television. Not only do the obligations of their fame sometimes weigh heavily on them, but they also have to babysit Paul’s mischievous grandfather. While they mainly want to play music and have fun, they’re giving their managers ulcers over all the times they slip away to party, fool around, or just tear up a schoolyard like young blokes with too many restrictions are wont to do. Paul’s grandfather causes trouble for them to sort out now and again, and the TV director is going mad with worry that they won’t make it to the show and he’ll be doomed to doing Welsh news programs forever. Much like Yellow Submarine, any semblance of a plot is secondary to the band being “themselves”, cracking jokes and playing music. To a certain degree, there’s even less plot here, because the film is just “a day in the life” (adjusted to be more interesting). There’s enough going on in individual scenes and it rarely drags, it’s just so loosely connected I wouldn’t even call it episodic. The style is a more traditional scripted narrative, and of course it is, because I’m pretty sure This Is Spinal Tap invented the mockumentary. Sometimes, especially in the beginning, the dialogue comes off stiff and unnatural, but in the beginning I was still figuring out what to expect, and I’m sure those scenes were shot early. The Beatles themselves are, as always, heavily stereotyped versions of themselves, but the only character I really didn’t believe at all was Paul’s grandfather, probably because he was a complete fabrication while the other characters were based on real people. Of course, the main draw of the movie is the music (and the chance to see the Beatles up close and larger than life). Some of the musical sequences I found to be tedious, but these were mostly the ones that haven’t rattled through the zeitgeist to be played for me 20 times a year. They usually found good reasons to be playing music, which shouldn’t be too hard in a movie about a band on the road. I think more than half were thoroughly enjoyable, which is a good ratio for an album. Many I didn’t even mind the distraction from the story. And I didn’t even get the sense that I needed to be high to enjoy it. Watch this movie: For a good romp with the boys from Liverpool playing songs you love. Don’t watch this movie: For a good story about the boys from Liverpool playing songs about what’s happening.